A turtle longer than my foot taught me a lesson last week about fear, life and salvation. I just wanted to save his life. I wasn’t expecting to learn anything. And I wasn’t expecting him to pee all over me. On a four-mile walk last Saturday, my mom and I ran into a turtle along a riverside path. He was headed for some netting, and we also worried a biker might run over him. I decided to pick him up and move him to the river, against my mom’s advice. But this turtle did not want to be rescued. He clawed at my hands to get away when I picked him up. 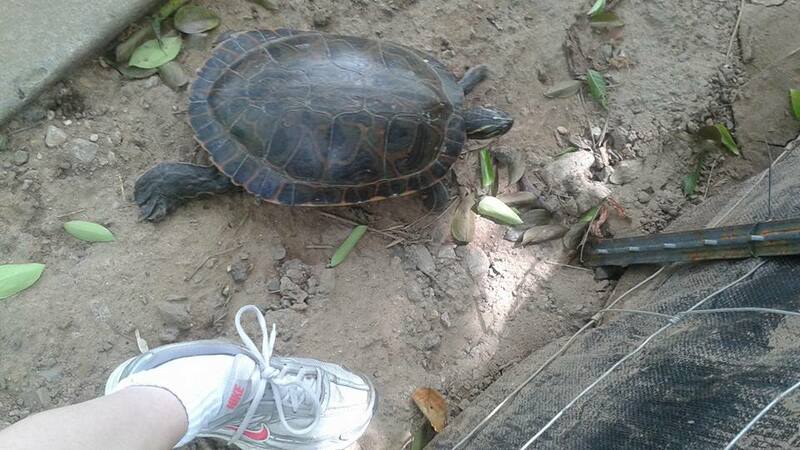 The turtle became heavy in my hands as I struggled to hold onto him and move him just a few feet towards the river. Then he peed all over my leg. In all this fighting against my saving effort, I decided to put him down. He sped over the rocks faster than I could have and waded into the river, away from human danger. And I spent the afternoon in despair over having terrorized a living thing I had intended to save. I realized the next day that we’re not that different from the turtle. I remembered that God’s thoughts and ways are higher than mine and that everything has its purpose–not in the trite things-happen-for-a-reason sort of way that people trumpet when they lack an explanation for hard circumstances. But God literally has a purpose for things even when the events around us seem senseless and it seems like he is trying to destroy us. It seems to me that people who don’t believe in the one true God lack a satisfying answer to the dilemma of why bad things happen to good people. And who can blame them? What we consider badness interferes with our sense of justice. And how much more must it hurt God that his goodness and omnipotence pain and terrify us? I’m so glad he doesn’t let me go when I fight to get away. The turtle taught me that the work of salvation–from circumstances or death–is painful for everyone.